Laos is not a country that thrives on tourism, but the peaceful beauty of this country still has a very special attraction for tourists. Luang Prabang is a favorite highlight of anyone coming to the country of elephants. Not as noisy, congested traffic, dusty as in the urban, Luang Prabang is peaceful and harmonious in the heart of nature, this is an ideal destination for those who want to find their own space of life. There are not many sights in Laos, they are mainly the spiritual relics and always drive people to good things. Visitors coming to Laos will find a peaceful, not squeezed life, and will feel close and familiar because native people are friendly, gentle. Luang Prabang (known as Luang Pha Bang in Vietnamese) was once the capital of the Kingdom of Laos from the 14th century until 1975. Today, Luang Prabang is a city of Luang Prabang Province and the ancient capital of Laos was recognized as world cultural heritage by UNESCO. Luang Prabang is located 425km north of Vientiane, on the bank of Mekong River. Coming to Luang Prabang is not as convenient as to elsewhere in Southeast Asia. While travelling by car is quite time consuming and dangerous, travelling by plane is always expensive. It will be cheaper if you travel from Hanoi because there are direct flights to Luang Prabang (unavailable in Ho Chi Minh City). Laos Airlines airline tickets are cheaper than those of Vietnam Airlines (several hundred thousands dong). The things attracting visitors to Luang Prabang are peaceful beauty of the scenery, architecture and daily life here. 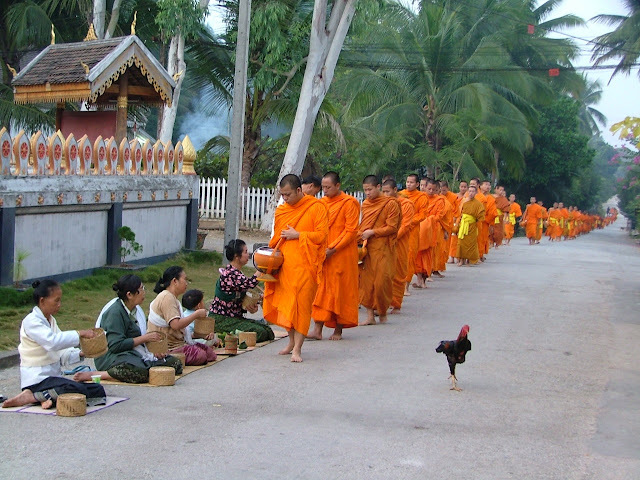 The monks wearing orange robe to beg for food in a long line through the old streets in the early morning is probably the most characteristic image of Luang Prabang. Every tourists coming here try to get up early to adore this both idyllic and peaceful pictures, and want to once kowtow beside the road with the locals to offer food, candies to the monks. 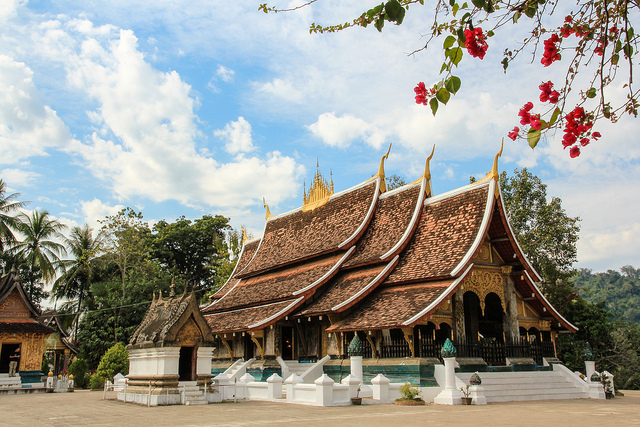 Laos is a country with the highest proportion of the temple (in comparison to the population); therefore, there are many ancient temples with beautiful architecture preserved very well in Luang Prabang. The temples are also not to miss places of tourists. Wat Xieng Thong is the most important temple in Luang Prabang. The temple is situated in the end of Sakkarin street, close to the junction of Mekong and Nam Khan rivers. It was built in 1560 under King Setthathirat’s reign. In major holidays of the year (New Year's ceremony, Pha Bang, Pha Man Buddha bathing rituals...), Wat Xieng Thong becomes bustling and boisterous. Especially, in the evening , thousands of people go to the temple to admire the gold Buddha and attend bathing Buddha with lotions and perfumes ceremony. By renting a bike, you can wander through the old towns with the flower trellis in the eaves, stop at deserted cafes along the roadside or wander the markets, night market where a lot of typical crafts of Laos are sold. Here, neither see beggars or hawkers who solicit and bother tourists. Just wandering around, you will feel most clearly the peaceful beauty of this city. And, in anywhere, you may also encounter the shadow of orange monk’s ropes hidden in the everyday life activities. 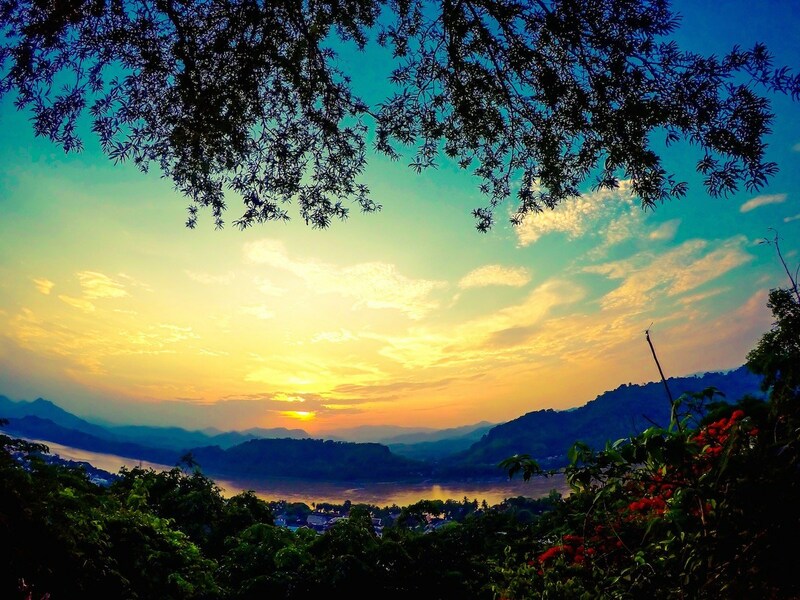 It is the image that has created a distinctive beauty of Luang Prabang. A favourite activity of visitors that can not fail to mention is to adore the dusk on Phou Si peak. From here, you can watch the sun slowly set off the side of the Mekong and catch in your eyes a panoramic view of the ancient, calm capital in the twilight. Did you know that you can create short links with AdFly and get dollars from every click on your short urls.